I will apologize in advance for sharing yet ANOTHER tidy-up rule. It’s just what’s going on in our house right now. 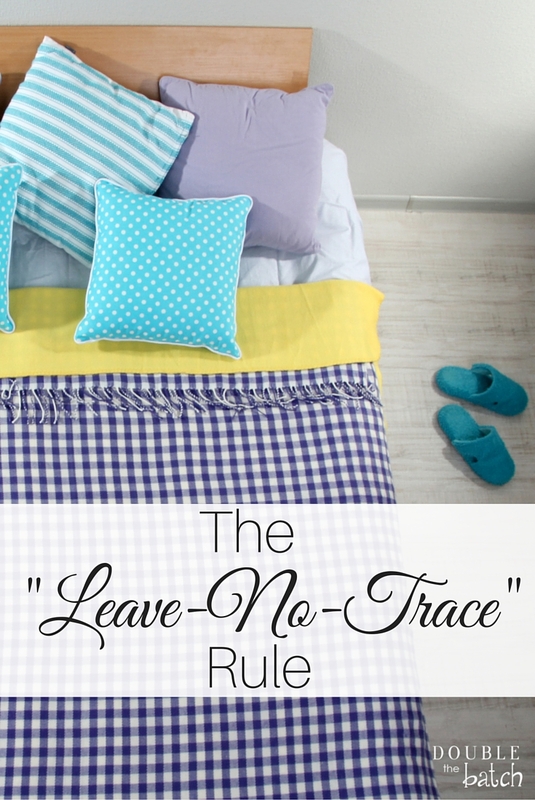 I’m not quite sure who came up with the “Leave no Trace Rule” but I think it was my husband. He would probably argue that it was me. Regardless of who started it, it has (by accident) been very successful in getting our kids (and us) to clean up after ourselves. I have tried SO many things to magically get my kids to clean up that it’s actually quite funny that this was successful. The worst thing about getting your family to clean up is the yelling, and nagging, and final exhaustion when it feels like no one is listening. You tell someone to pick up their coat, or their backpack, or their dirty socks (don’t even get me started on socks!) and then find them still lying there an hour later with kids who SWEAR that they didn’t hear you! If you’ve ever worked with cub scouts you know what the Leave No Trace Rule is. It basically means that the scouts are to always leave nature the way that they found it, to carry their trash, be respectful of trails, and basically leave a place the exact way they found it so that no one would even know they had been there. They immediately picked up on the cue and it became an easy way to let someone know that they had forgotten something without telling them specifically why we were irritated. So, for example, instead of saying, “Katie! You left your coat lying on the floor again! Please come pick it up!” I would simply say, “Katie, leave no trace.” She would then come in to find out HOW she had left any trace and take care of it. I know it sounds to simple to work, but it just has and I thought I had better share! This one simple phrase has also led to other things that have helped us keep our home clean-er the past month. I’m excited to share more in the coming weeks. I know the holidays are approaching and this is not a very “holiday-ish” post, but I also know that holidays can be stressful and clutter only create more stress for some parents. Hopefully this will help someone else in need of a little less clutter this year.